Top Taggers Some of the top taggers of 2012 are pictured with VGFTP officials: Front, L-R: Susanna Musick (VIMS), Carl Stover, Jay Duell, Rob Choi, and Lewis Gillingham (VMRC); Rear, L-R: Ed Shepherd, Jim Robinson, Sheldon Arey, and Ed Lawrence. Photo by Rob Choi. If you went fishing in Chesapeake Bay in 2012, you may have noticed it was a banner year for red drum. Catches of these and other fishes led to an exceptional year for the Virginia Game Fish Tagging Program. The program—supported by funding from Virginia’s saltwater license funds and the Virginia Institute of Marine Science—trains volunteer taggers to provide fisheries managers with data on migration patterns and habitat use of 10 species of recreationally important finfish. It has been a cooperative project of VIMS and the Virginia Marine Resources Commission (VMRC) since 1995. In 2012, program volunteers tagged more than 31,600 fish, setting a new record. 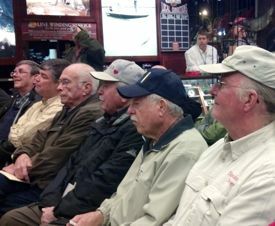 The volunteer anglers who contributed to these records were acknowledged on February 22 at the annual Tagging Awards Program at Bass Pro Shop in Hampton. Taggers were recognized in 12 categories, including most tagged fish overall, most recaptured fish, and most tagged fish of a single species. First-place taggers in each category received a plaque, and runners-up received a tackle bucket with fishing gear provided by Bass Pro Shop.